Every major US city is plagued by gang violence. While there are a number of proper gangs, this world is dominated by two in particular: the bloods – most recognizable by their red colors, and the crips – most recognizable by their blue colors. There is one city in particular where the gang violence affects us all, and that city is Washington, D.C. The gangs there are also recognizable by their ‘colors’ but they’re not bloods or crips. They are republicans and democrats. And their never-ending beef with one another hurts us all in the way of egregious taxes, disastrous policy, a broken economy, and comprehensive dysfunction. Look no further than the recent government shutdown; republicans sought to stymie funding of obamacare – an ill-fated democrat brainchild – through refusing to raise the debt ceiling. Their obstinacy ground the entire federal leviathan to a halt. Ignore for the time being that our government depends on increasing debt to merely keep the operation running. We will see this turf war happen again in just a few short months and as much as I would like to say government shutdowns don’t matter, they most certainly do. Primarily because our government has grown so entangled in our economic affairs that when it shuts down there are real consequences. Businesses selling goods and services to the federal government recognize no revenue. National Parks – which we the people own – are closed to tourism. Industries subject to federal inspection due to regulation are forced to halt production. These are concrete examples but more abstractly the notion that gangsters – I’m sorry, ‘politicians’ – would be so willing to use us all as collateral in their turf war shows what little regard they have for their constituents. There is no right or wrong in this mess, they’re all malcontents. It is time to evict these gangsters from the offices they hold. How? For starters I suggest you adopt a policy of voting ALL incumbent gangsters out of office. Regardless of which color they fly, red or blue, every politician who has been in office should be replaced after one term. The only reason they wage their turf wars is to preserve and extend their time in office. Once they’re voted in, they care only about being re-elected. So they adopt policies and positions that are most expedient in ensuring that result whether it’s good for their constituents or not. And every American is caught in the crossfire. So vote them out, every last one of them. It’s a disgrace that congress men and women maintain their offices for decades. By adopting an all-incumbents-must-go voting policy, you will also be putting the newly elected on notice that they will enjoy just one term so they might as well do what’s right instead of what’s expedient for their career. We have a beautiful opportunity to do this every four years during the mid-term elections for congress, so start sniffing for the foul incumbents who are ripe for replacement in 2014. To take it a step further you might consider running for yourself as a write-in candidate. Whether you seriously want to win or not, you will probably get at least one vote from yourself. And in the process you will deprive both gangs of that one vote. That individual ethos times thousands or millions will eventually reach critical mass and disrupt the status quo with great effect. If you are not legally qualified to run or do not wish to bother with the effort, vote for another write-in candidate. After all it can’t be worse than what we’ve already got, can it?! I’ve posted several times about my own write-in campaign as it relates to the Presidential election in 2016. 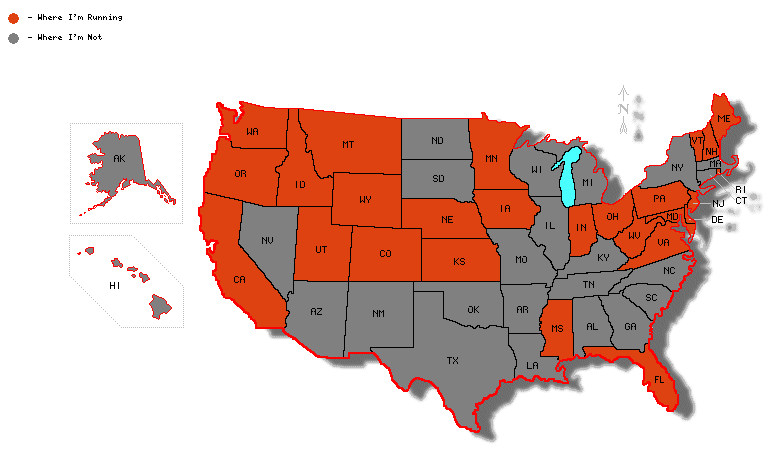 Adopt my strategy as your own or feel free to support me if you live in any of the 26 states I’m running. Whatever you do, stop enabling the gang violence in Washington D.C. and refuse to be treated as collateral in their turf wars. Not casting a vote at all just leaves it in the hands of the more extreme voters on both sides. You deserve more as a voter and you’re entitled to more as a U.S. citizen. So vote the incumbents out, run for yourself, or find another write-in candidate and cast your vote for them. This entry was posted in Politics on October 26, 2013 by coreysterner. On the political issues in America our mainstream politicians are more polarized than ever. On virtually every issue we’re presented with two distinct sides in ideological opposition with each other. These sides are represented by the two dominant political parties (Democrat, Republican) and they generally represent the left and the right respectively. They maneuver themselves to portray every issue as a black or white, A or B choice for the voting public. The first problem with this maneuvering, or framing of their argument, is that the choices on a given issue are rarely so cut and dried. Nuance is neglected and foresight forgotten. Career politicians are simpletons after all, and contrast is the oxygen they need to survive. So while mainstream politicians cut quickly to one extreme or another, the voting public tends to be more fluid which better reflects reality. The biggest problem with the dominant parties’ framing of issues as choice A or choice B is that they contradict their principles and lose credibility with the intelligent voting public. Consider abortion. Those on the left side of the spectrum (Democrat, liberal, etc) make impassioned pro-choice arguments, in particular the right for a woman to choose whether to terminate or deliver the life inside of her pregnant body. This right is backed by the supreme court’s decision on Roe v. Wade in 1973. For now let’s set aside the difficult definition of life. The right side of the spectrum (Republican, conservative, etc) makes impassioned arguments for the federal protection of life inside of a pregnant woman, despite the Supreme Court’s ruling. The right is pro-life and the left is pro-choice, slogans that we’re all accustomed to. The issue, at its core, is a question of whether the federal government has the right to override legal precedent for the choices an individual has to make for themselves. Now consider gun control. Those on the right side of the spectrum make impassioned pro gun arguments, in particular the right of an individual to choose firearms as a means to protect their life and property. This right is backed by our constitution’s second amendment “right of the people to keep and bear arms”, ratified in 1791. For now let’s ignore the purposes for which the second amendment exists. The left side of the spectrum makes impassioned arguments for the federal control of firearms, despite the second amendment. The left is pro gun control and the right is pro-choice. This issue as well, at its core, is a question of whether the federal government has the right to override legal precedent for the choices an individual has to make for themselves. The harder each side fights on one issue, the more they compromise their credibility on the other. Complete hypocrisy. For honest reconciliation, the right must concede on abortion to win their position on gun control, and the left must concede on gun control to win their position on abortion. Nuance! And most would agree that the probability of this reconciliation happening is abysmally low. My solution lies not in the choosing of either side on either issue but in choosing a third way. A way that places a premium on the individual’s right to life, liberty, and the pursuit of happiness. These among ‘certain inalienable rights’ as framed by one of our nation’s Founders, Thomas Jefferson. His own inspirational sources preceding the American Republic – visionaries like John Locke. Through the ages people have decried their time as unique and without precedent, but the beauty in America’s governmental framework lies in its timeless application. We were founded upon certain anticipatory principles, informed by historical reference, that would allow our Republic to flourish for as long as we adhered to those principles. Life. Liberty. The Pursuit of happiness. A simple and explicit litmus test against which to measure our positions. By rejecting the false choices we’re presented with in favor of this third way, we will deprive today’s career politicians of the oxygen they so desperately need. Tomorrow’s leaders will inevitably emerge who embody the more moderate and sensible views of the voting public, because that’s where new oxygen will be found. The task before us voters is to create that new oxygen by rejecting the status quo and running as candidates ourselves until new leaders emerge and earn back our votes. No more tolerating hypocrisy or settling for the lesser of two evils. Take ownership of your vote and spend it on a candidate who best represents ALL of your beliefs without compromise…even if the only candidate in the field is yourself. Well now, how’s that for bold?! Not bold in the sense that old Bill wrote it, but in the way I’m using it to open my first post. And even more so in the way my Great Grandfather was inspired by the phrase to choose the name ‘Sterner’ at Ellis Island as a Swedish immigrant. He arrived with the family name Gustafson and, having chosen Shakespeare’s works to teach him English, announced STERNER when prompted for a NEW name in his NEW country. Now how do I honor his bold choice and what does this blog have to do with it? To put a fine point on it, I intend to run for President of The United States of America (POTUS) in every election for the rest of my life. The election of 2016 will be the first in which I meet every constitutional requirement for holding the office of the Presidency. Before you dismiss this as fringe lunacy, read on and allow me to explain. The political state of affairs in America is at an all-time low, with such ideological polarity and two-party dominance that I, like so many Americans, am fed up with the platforms supporting our two main parties. Every election cycle the predictable deception, pandering, and vitriol of both parties is on display for the American electorate. Intense effort is made by each party to differentiate themself from the other. And while they are indeed separated by an ideological gulf, the governing record of both in power is remarkably close in shoreline. So what appeared to be a stark choice during the election amounts to the same old governance we’ve all grown to loathe. And around one year in advance of the quadrennial election, the voting public can be heard saying, in millions of conversations, ‘well I don’t like either party/candidate very much, so I will just vote for the lesser of two evils’. I demand we ask WHY we feel the need to settle for what appears to be the lesser of two evils. What compels us to buy into this manufactured choice? Is it because we’re so convinced the party most representative of our opposing ideology will govern as such? Is it because we’re so convinced that the party most representative of our favoring ideology will be so superior? I suggest yes on both counts. And I suggest we’re wrong in falling for this false choice. There must be a better way. I have decided personally to no longer compromise my political beliefs; our government is one By The People, For The People. And as such my positions are just as credible as any other American’s, whether that American is carefully groomed for power by party elite or reduced to a statistical ‘voter’ by the same elite. So I am beginning my own political experiment by running for POTUS myself from here on out. No more compromise, no more choices for the ‘lesser of two evils’. If on my deathbed I can look back and say that, politically, I always voted for the candidate who BEST represented MY beliefs, then I will be a satisfied man. Beginning now, that candidate is me. And if the only legally counted vote I receive in each election is my own then so be it. If it inspires others to make the same choice, then all the better. I hope my experiment leads their way or at least assists them in discovering great candidates organically. I will use this blog to document my journey: obstacles, successes, failures, and frustrations. As I write this I don’t know if my name will legally qualify as a write-in vote – in my home state or others – in 2016. But I’m going to make one hell of an effort to make it so. Thomas Jefferson expressed my motivation best when he said, “I would rather be exposed to the inconveniences attending too much liberty than to those attending too small a degree of it“. Our founding fathers set forth simple requirements for citizens aspiring to the office of the Presidency. Those requirements should make my quest a highly viable one, but what inconveniences I encounter along the way remain to be seen. Welcome to my journey and thank you for your interest. This entry was posted in Politics and tagged United States, Voting on January 20, 2013 by coreysterner.